Essential oils can be diffused to freshen the air, naturally deodorize any space, and enhance your cleaners! With spring cleaning in full force, it's important to use a cleaner that is not filling your home with harsh chemicals. Many commercial cleaners are filled with harsh chemicals that negatively impact our health and the environment. Scientific evidence is continuing to prove that exposure to harmful chemicals in your home is a contributing factor in many diseases. If you want more information and science on this topic, check out the Healthy Home PowerPoint in Young Living University. What can you do to improve your home cleaning? It's simple! Use plant-based cleaners such as Thieves Household Cleaner, or try making your own DIY cleaner with these powerful essential oils! 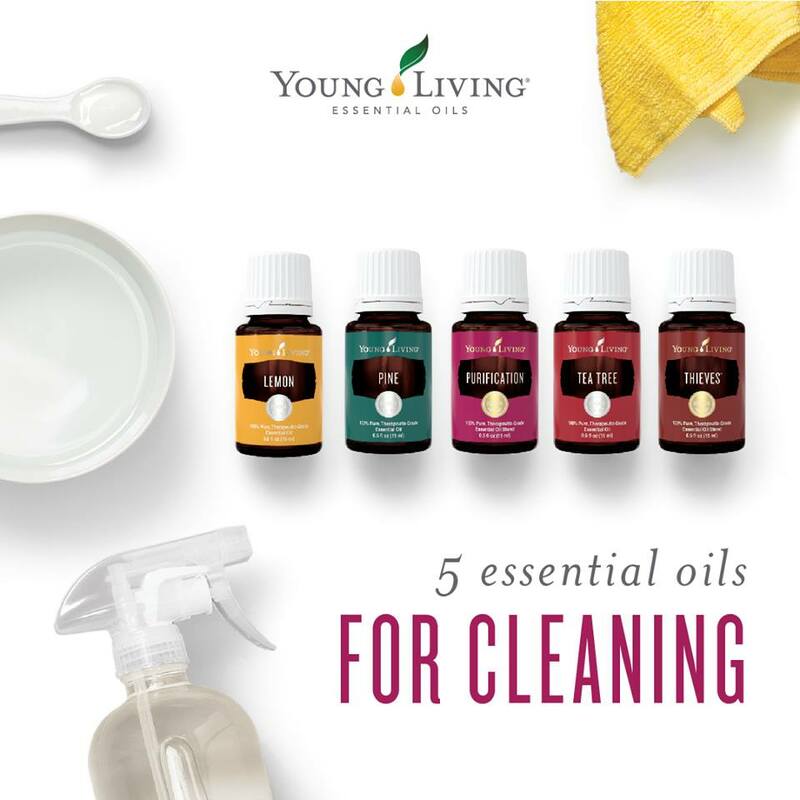 Adding a few drops of essential oils such as Lemon, Pine, Purification®, Tea Tree and-of course-Thieves to your naturally derived cleaning solutions is all you need for a powerful cleaning solution without the harmful chemicals! To order, look up the “Thieves Home Cleaning Kit” and use Member #912061 to create your account. -Often found in cleaners and soaps, Lemon's citrus scent is an indispensable freshener in any home and is a cleaning must-have. -Lemon has an energizing and uplifting aroma. -It makes a great adhesive remover! Use a few drops to help remove stickers, labels, and goo from surfaces! -Add a few drops to your laundry detergent or wool dryer balls for a pleasant, refreshing aroma. -Add a few drops of Lemon to your surface cleaning solution to clean your floors, surfaces, and windows. -Add a few drops to your toilet bowl to keep the room smelling fresh. Pro tip: Put a few drops in the bowl before you go to keep the room smelling fresh. Game changer. -Make a toilet spritz by combining 15 drops of Lemon in ½ cup of rubbing alcohol and ½ cup of distilled water and save it in a glass spritzer bottle. Keep it handy to spray toilets before using to avoid smells from filling the room. -Pine essential oil is steam distilled from the needles of the Pinus sylvestris tree, which originates in Austria, the United States, and Canada. -Refresh your home with the rich aroma of Pine. This essential oil is a great addition to floor surface cleaners and creates an aroma reminiscent of fresh air and the outdoors. -It adds a clean, sweet scent to your home when diffused! -Add it to your Thieves Household Cleaner to mop your floors. -Combine Pine with water and spray it on carpet for a fresh smell after vacuuming. -Add a few drops of Pine to olive oil and Thieves Household Cleaner to shine your wood furniture and floors. -Replace overpowering aerosol fragrance sprays with Purification. This blend is great to keep your home and laundry fresh. -Purification is made up of six essential oils for the ultimate tool against odors: Citronella, Lavandin, Lemongrass, Rosemary, Myrtle, and Tea Tree. -It creates a refreshing, bright scent that keeps you and your family happy and comfortable, especially in the springtime! -Add a few drops to laundry to give your wash a great-smelling boost. -Place a few drops on cotton balls or wood clothes pins and stash them wherever necessary: the car, closets and drawers, air vents, shoes, or gym bags. -Create your own air freshener by mixing 5 drops of Purification and 2-3 drops of your favorite essential oil, plus a cup of distilled water, in a glass spritzer bottle to attack offensive smells after cooking. You can also use it to freshen your linens. -Tea Tree is best known for its ability to get rid of musky, undesired odors. Diffuse it anywhere that needs some refreshing. -Tea Tree is a great natural deodorizer. -Mix 5 drops of Tea Tree and 3 drops of Lavender with a cup of baking soda to make your own carpet powder. Sprinkle it over carpet, let it sit for 15 minutes, and then vacuum away! -This blend is a powerful combination of Clove, Lemon, Cinnamon Bark, Eucalyptus Radiata, and Rosemary essential oils. -Thieves fills any space with a rich, spicy aroma when diffused. -Add a few drops to your dishwasher or dish water to thoroughly clean your dishes and eliminate odors. -Add a few drops of Thieves to a cotton ball and leave it resting on your air conditioning vent to infuse your room with its spicy, sweet aroma and eliminate odors. -Mix 1 part Thieves Household Cleaner and 3 parts baking soda to create a thick, deep-cleaning paste. Apply the mixture to desired areas and scrub thoroughly.